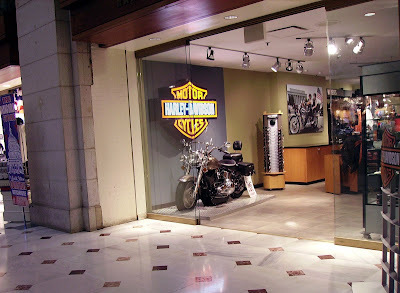 Harley-Davidson store inside Union Station, Washington, D.C.
My road trip from Florida to Washington, D.C. allowed me to visit two Royal Enfield dealerships. Both were friendly. One was amazing. One was bare bones. Had I wanted, I could have stopped in an untold number of Harley-Davidson dealerships, all over the top. Every exit on I-95, it seemed, featured a huge billboard advertising the town's Harley dealership. Now, keep in mind that very few billboards on U.S. roads anymore advertise Chevrolet dealerships. Harley is making a huge effort. The most dramatic example I saw was Battlefield Harley-Davidson in Gettysburg, Penn. Gettysburg, of course, is the location of the largest Civil War battle. In 1863 165,000 soldiers visited this little community in Southern Pennsylvania. Only 114,000 of them walked away. Battlefield Harley-Davidson has the billboard out on the main road. But it also has ads in almost every piece of tourist literature I picked up, often the major advertisement in some. One ad showed a picture of a man in the full uniform of a Union officer riding a full-dress Harley. Battlefield Harley-Davidson is fully engaged. One ad noted that there is "always something" going on at Battlefield Harley-Davidson. Another promises "fun for the entire family." The dealership obviously participates in every special occasion at Gettysburg. And why not? It looks like a fun operation, totally devoted to its product and its community. I'll write more about the Royal Enfield dealerships I visited but no account of my road trip would have been complete without a nod to Harley's example of how to sell motorcycles. I assume there is no need to mention the presence of Harley-Davidson stores in airports and (in Washington, DC) even at the train station. They're just selling t-shirts but they're fun, too.